This post will teach you how to refill your HP 82 black, yellow, cyan and magenta ink cartridges in just a few simple steps. The HP 82 print head ink cartridges, both the designjet and inkjet pro models, were made for commercial printers and tend to work with small ink tanks or deposits that function thanks to the print heads installed on the cartridge. These cartridges come in two different versions, and the refill procedure will depend on which version you’re using. The first version only holds 28ml of ink, but the second or extra-large version hold about 69ml of ink in total. All the colored ink that’s used to refill this cartridge is water-based or dyed. However, the black ink they use is pigmented, which is a bit harder to find. If you own these cartridges and want to refill them, we recommend you always use the corresponding type of ink for each color, so please use pigmented black ink and dyed or water-based colored ink. These ink cartridges are compatible with the following printer models: HP designjet 800/800ps; HP designjet cc800ps photocopier; HP designjet 815 multifunction printer; HP designjet 820 multifunction printer; HP designjet 500/500 plus/500ps; and HP designjet 510 series. These printers can no longer be found in the market. If you happen to own any of these, take good care of it and try not to damage it or replace it for any other model that promises to execute the same functions. 1. First of all, keep in mind you must use a different syringe for every ink color. 2. Get your hands on a piece of cloth, preferably black, for any ink spills that may occur. You may also use a flat surface you can clean easily after this process is finished. 3. Take a good look at the ink colors to avoid injecting the wrong one into the cartridge. Doing this would end your cartridge’s working life, since the damages caused by adding a different color to a cartridge can be very difficult to fix. Before you start refilling your ink cartridge, put it on a piece of black cloth or on top of a flat surface you can clean easily in the future. This cartridge, as well as all the others that have print heads just like it, are refilled by removing the bottom part. This expose the cartridge’s injector, it’s pump and the exact location where you must refill it. Please take a look at the following picture of how to remove the bottom of the cartridge. 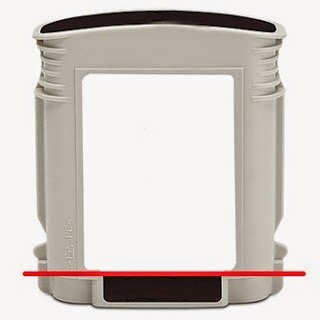 You must make the cut exactly where the red line appears on the cartridge. Cut along this line so the cartridge divides in two and you’re able to see what’s on the bottom of the cartridge. After removing the label from the cartridge, it should look something like the following picture, where you can see all the parts we mentioned earlier. For this step, you will need an empty syringe. You will use it to try and take out a small, black rubber ball that’s marked on the following picture with #1. Do this as slowly and carefully as possible to keep the little ball from going inside the cartridge, and always make sure you have it with you so it doesn’t get lost. You may now proceed to filling the syringe with the adequate amount of ink. If you’re using a regular cartridge, you should use 28ml of ink. If, on the contrary, you’re using an extra-large version, you must use 69ml of ink. Something you must always keep in mind is that you should never refill this cartridge with a puncturing syringe. Inside these cartridges, there’s a metal sheet a frail as parchment paper. If you use a puncture syringe, you may pierce it and damage it, leaving the cartridge with a permanent ink spill. This is why we recommend you push the syringe very little into the cartridge: to avoid puncturing altogether. Remember to use but the tip of the syringe. After you’re done with this procedure, place the small, black ball back on the cartridge, which acts as a plug and keeps the ink from coming out. Please be very helpful to avoid pushing the ball inside the cartridge. Finding a new one is very difficult, and it’s very unlikely you’ll be able to take it out of the cartridge without damaging it. After you’ve put the ball back on the cartridge, leave it with the orifice facing downwards. In this ay, you’ll be able to tell if everything came out well and if there’s any ink leaking from the cartridge. You should check both the injection orifice and the place you just sealed with the small ball. Finally, put the lower lid back on the cartridge, and leave it with the lid facing downwards to check if there’s any problem or new spils. If you’ve followed every steps as described in this post, your printer should now be working without any problems. If things haven’t gone out according to your plan, don’t worry, we’re here to help. Just leave a comment in the section below this post and we will gladly help you out.